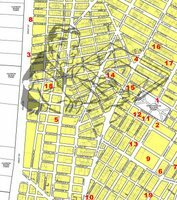 The companion map to the Architecture map of Greenwich Village and SoHo has been added to the NYCAtelier site. This map, the Architect map to Greenwich Village and SoHo, highlights the architects of some of the most notable buildings in the area. The map also provides additional information about the architects, as well as a suggested route for a self guided tour of the area.